The first reactor at Barakah Nuclear Power Plant - the UAE's first nuclear power station - is almost ready, a top official said on Monday. 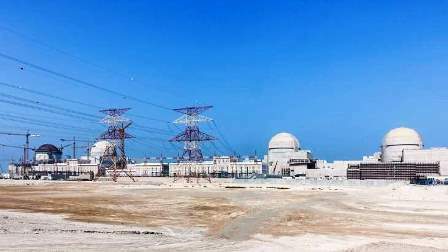 Federal Authority for Nuclear Regulation (FANR) Director-General Christer Viktorsson said the regulatory body is now reviewing the operating license application made by the Emirates Nuclear Energy Corporation on behalf of Nawah Energy Company to operate Units 1 and 2 of the plant in Al Dhafra. "The reactor is almost technically ready," Viktorsson said during a media briefing. In September last year, Minister of Energy Suhail Al Mazroui had said that the first reactor is 96 per cent complete. FANR director-general said the operator will be granted the license if all regulatory requirements are met. "We want to ensure highest levels of safety and security are met." It is a series of tests and inspections to ascertain the safety and security at the plant. Last year, FANR conducted more than 40 inspections related to Barakah. The inspections included verification of the licensee's operator training and certification programme and organisational readiness for Unit 1 operations, cyber security, nuclear fuel storage as well as other requirements. "We are continuously doing readiness inspections. We have still number of inspections to do." These inspections result in findings which are then send to licensee to take corrective actions, Viktorsson noted. Also last year, FANR carried out more than 746 inspections across the country, which according to Viktorsson led to an 'improvement of the safety culture'. "There's a better understanding from licensees with regard to radiation safety and protection." Viktorsson elaborated that FANR continuously monitors the radioactivity levels in the UAE environment through its laboratory at Khalifa University and through its radioactivity monitoring stations in various locations across the country. On emergency preparedness, Viktorsson said FANR's Emergency Operation Centre is ready with state-of-the art equipment to coordinate its response in case of any nuclear or radiological event. In 2017, FANR led and took part with national and international stakeholders in more than 10 drills to test the Centre and to build national capacity in terms of emergency preparedness. "This year, FANR aims to strengthen the capacity of Emergency Operation Centre by coordinating with national and international partners. We have plans to hold around 15 emergency drills and exercises in 2018," he said. FANR is dedicated to developing Emiratis in the nuclear sector. "Last December, 17 Emiratis graduated from our flagship programme the Developee Engineers Programme. In 2018, a batch of six will join the prorgamme to be trained and join the nuclear sector. In 2017, FANR total workforce reached 222 employees - 64 per cent of which is Emiratis." Also, FANR aims to boost cooperation with the International Atomic Energy Agency. "We expect to sign several Memorandum of Understanding, including with FANR counterparts in China." In a bid to create more awareness among general public about the nuclear sector, FANR has recently launched community outreach programme by engaging with schools, universities and others.